Package includes: Teacher's Lesson Guide, Volume 1/Guía del maestro: Lecciones Volume 1 - The Teacher's Lesson Guide provides easy-to-follow lessons organized by instructional unit, as well as built-in mathematical content support. Lessons include planning and assessment tips and multilevel differentiation strategies for all learners. This English/Spanish Edition provides dual language support. Teacher's Lesson Guide, Volume 2/Guía del maestro: Lecciones Volume 2 - The Teacher's Lesson Guide provides easy-to-follow lessons organized by instructional unit, as well as built-in mathematical content support. Lessons include planning and assessment tips and multilevel differentiation strategies for all learners. This English/Spanish Edition provides dual language support. Teacher's Lesson Guide, Volume 3/Guía del maestro: Lecciones Volume 3 - The Teacher's Lesson Guide provides easy-to-follow lessons organized by instructional unit, as well as built-in mathematical content support. Lessons include planning and assessment tips and multilevel differentiation strategies for all learners. This English/Spanish Edition provides dual language support. Teacher's Lesson Guide, Volume 4/Guía del maestro: Lecciones Volume 4 - The Teacher's Lesson Guide provides easy-to-follow lessons organized by instructional unit, as well as built-in mathematical content support. Lessons include planning and assessment tips and multilevel differentiation strategies for all learners. This English/Spanish Edition provides dual language support. Teacher’s Reference Manual (Grades 1-3) - Contains comprehensive background information about mathematical content and program management. Spanish Assessment Handbook - Grade-specific handbook provides explanations of key features of assessment in the Everyday Mathematics program. Includes Assessment Masters. Spanish Differentiation Handbook - Grade-specific handbook provides that helps teachers plan strategically in order to reach the needs of diverse learners. Spanish Home Connection Handbook (Grades 1-3) - Enhances home-school communication for teachers and administrators. Includes masters for easy planning. Minute Math (Grades 1-3) - Contains brief activities for transition times and for spare moments throughout the day. Spanish Math Masters - Blackline masters for routines, activities, projects, Home Links/Study Links, and games. Number Grid Poster Sunrise/Sunset Chart Content by Strand Poster One set of Student Materials Spanish Student Math Journals (Volumes 1 & 2) - These consumable books provide daily support for classroom instruction. 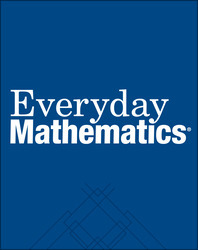 They provide a long-term record of each student’s mathematical development. Spanish Student Reference Book / Libro de consulta del estudiante (Grades 3) - This book contains explanations of key mathematical content, along with directions to the Everyday Mathematics games. Pattern Block Template  A clear, green, plastic tracing template contains a variety of geometric shapes with six of the shapes exactly matching the sizes of the pattern blocks.